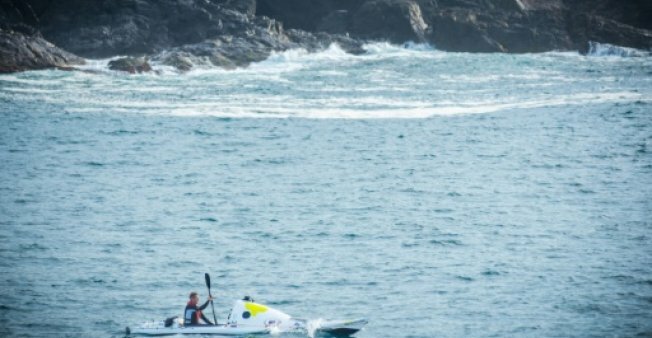 WELLINGTO: A New Zealand adventurer has become the first person to kayak the Tasman Sea solo after a gruelling two-month voyage that saw him pestered by a shark and battling “washing machine” conditions. Scott Donaldson set off from Australia’s Coffs Harbour on May 2 and paddled ashore at New Plymouth, on New Zealand’s North Island late Monday night. The 48-year-old’s 2,200-kilometre (1,370-mile) journey took him across one of the southern hemisphere’s most notorious stretches of water in a six-metre long carbon-fibre kayak. Donaldson said he often paddled for 16 hours a day in choppy conditions and swells of up to six metres. “It was bloody hard work, I’m knackered,” he said. About halfway through the trip a “frisky” shark approached the kayak as he was taking a break, forcing him to resume paddling. “We had a little game of peek-a-boo and he wanted to chew on my rudder but luckily I managed to avoid that,” he told TV3. Donaldson, who undertook the journey to raise funds for asthma research, said after he landed that he was looking forward to a shower and tucking into a meat-and-vegetable pie. He made a similar attempt in 2014 but had to abandon it after being at sea for 84 days — and coming within 80 kilometres of the New Zealand coast — when his kayak capsized in a storm. A 2007 attempt to kayak the Tasman by Australian Andrew McAuley ended in tragedy when his vessel overturned within sight of New Zealand.